Beclere Method is an xray examination of the knee, to best demonstrate the intercondylar fossa an AP axial projection is taken. 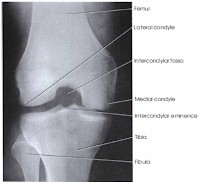 The femoral condyles, tibial plateaus, and intercondylar eminence are examined for evidence of bony or cartilaginous pathology, osteochondral defects, or narrowing of the joint space are also seen in radiograph. Note: This is a reversal of the PA axial projection for those who cannot assume the prone position. This, however, is not a preferred projection because of distortion from the CR angle and increased part-IR distance, unless a curved cassette is available. This projection also enhances exposure for the gonadal region. Detail screen, small focal spot ( 65+- 5kV range) (grid not needed because of air gap). Place lead shield over pelvic area, extending to midfemur. 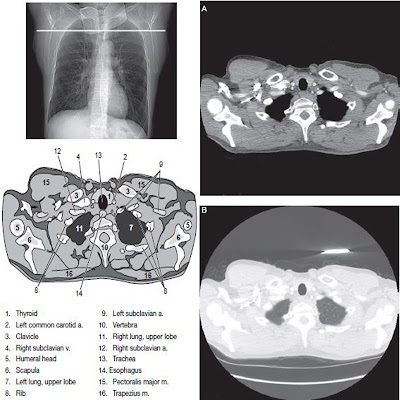 Take radiograph with patient in the supine position. Provide support under partially flexed knee with entire leg in the anatomic position with no rotation. Flex knee 40 to 50 degree, and place support under cassestte as needed to place cassette firmly against posterior thigh and leg. Adjust cassette as needed to center IR to mid-knee joint area. 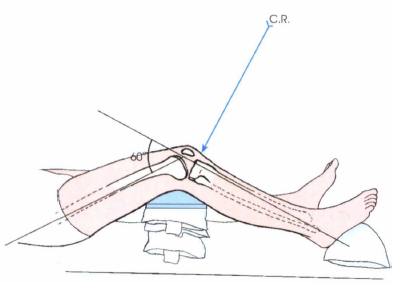 Direct CR perpendicular to lower leg (40 to 45 degree cephalad). Direct CR to a point 1/2 inch (1.25 cm) distal to apex of patella. Collimate on four sides to knee joint area. Center of four-sided collimation field should be to mid-knee joint area. 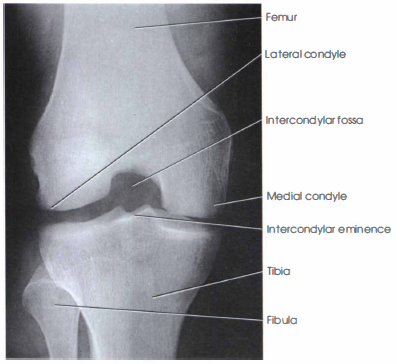 The intercondylar fossa should appear in profile, open without superimposition by patella. The intercondylar eminence and tibia plateau and distal condyles of femur should be clearly visualized. No rotation will be evidenced by symmetric appearance of the distal posterior femoral condyles and superimposition of approximately half of the fibular head by the tibia. Optimal exposure should visualize soft tissue in the knee joint space and an outline of patella through the femur. Trabecular markings of femoral condyles and proximal tibia should appear clear and sharp, with no motion.